If we get it right–and Bradford Grammar School does–education will kindle an intellectual and emotional response from students to encourage insight and curiosity, and provide the tools to make a valuable contribution to society. BGS does all these things as part of its daily routine providing an education that enriches mind, body and spirit. Walk through the magnificent Price Hall and into the modern Clarkson Library and you will get an instant feel for the blend of the traditional and the innovative that BGS achieves for its students. A characteristic which is immediately identifiable with us. We are defined by our rich heritage and forward-looking approach. 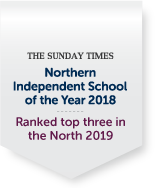 Outstanding GCSE and A Level success is available to all students at BGS by virtue of the inspirational teaching and learning that adds value to every student. Learning at BGS is engaging, active and fun. Value, however, is added in more ways than one and we care deeply about nurturing the whole person and provide a wealth of popular co-curricular opportunities. Essentially, BGS is an aspirational but caring school that knows what it is about. Students are respected as individuals by their teachers and pastoral care is a priority. Ultimately, our students are busy and excel at what they do because they are happy, supported and part of a community with shared goals and ambitions.